A pre-major and transfer social work faculty advisor meets with students individually to help them set and plan academic goals, plan or change a course schedule, evaluate transfer credits and plan their coursework prior to admission to the baccalaureate program. Following acceptance into the program, each student is assigned a permanent social work faculty advisor who will provide the student guidance through the BSW curriculum, offering academic and professional advising. To schedule a meeting with an advisor, please find the contact and office hours for our BSW Advisors below. For courses and detailed program requirements, see the Social Work Bulletin and click on the Undergraduate or Courses tab. 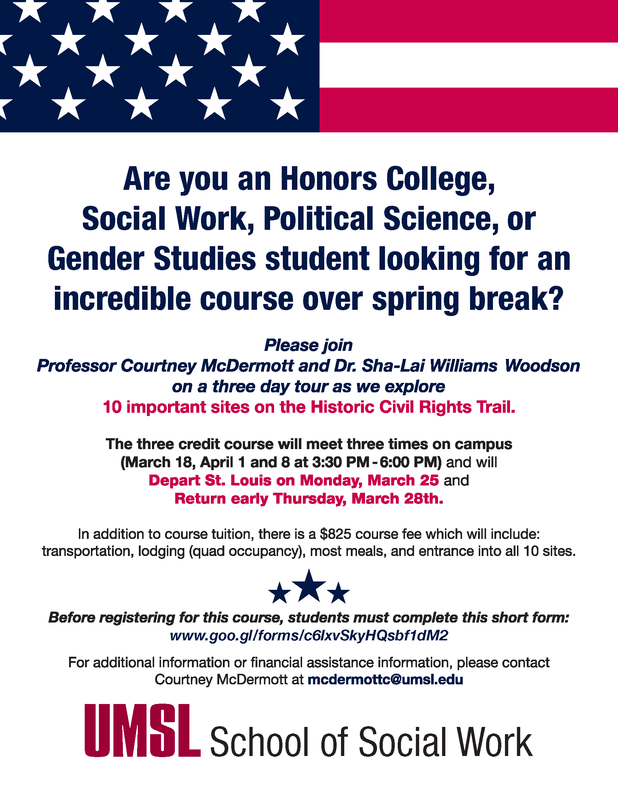 Social Work 2030: Civil Rights Tour is a 3 credit-hour course that will take you on a 3-day tour of 10 important sites on the Historic Civil Rights Trail.